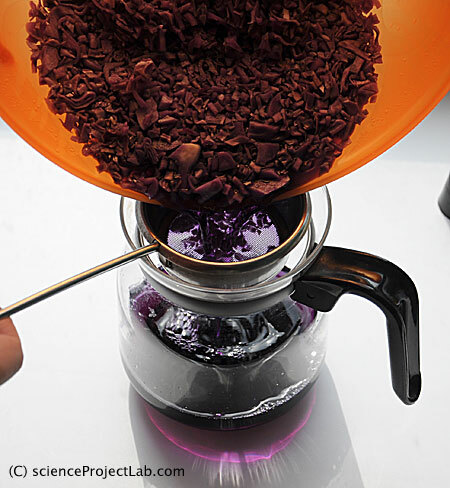 Red cabbage indicator is the purple pigment that can be easily extracted from the red cabbage leaves and used in further experiments to find a pH value of the chemical solution or for titration experiments. It’s a nice and colorful tool for your home laboratory! 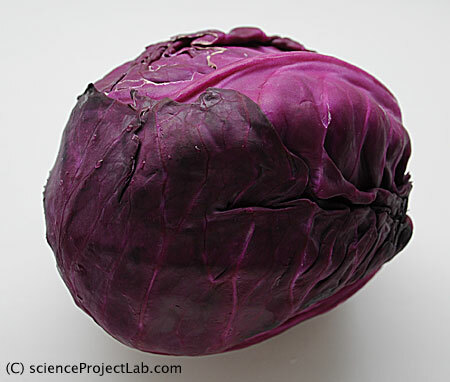 The purple colour of red cabbage caused by substance called anthocyanin. Antocyanin and a large variety of similar pigments from the flavonoid family cause most of the color diversity in higher plants. Blue, yellow and red colors of flowers, fruits and autmn leaves are caused by those pigments. Anthocyanin has the ability to widely change it’s colour depending on the concentration of positively charged H+ ions in the water, which makes it pretty sensitive natural indicator of pH. Red cabbage juice contains anthocyanin, which is a natural indicator. Cut red cabbage on quarters. Take one quarter and shred it with knife or use a food processor to chop the cabbage. Put chopped cabbage into the bowl. Pour boiling water in the bowl, just so that the leaves are slightly covered. 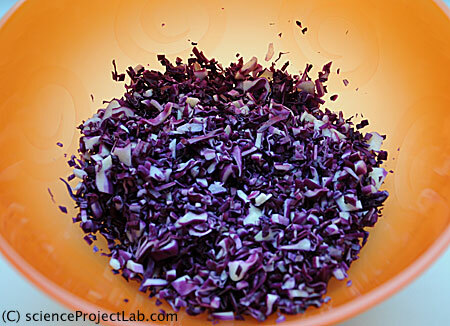 Chop red cabbage to extract the pigment. Leave it to soak and cool for 30 minutes. Filter cabbage juice through a sieve. Your red cabbage indicator solution is ready. You can keep it in a fridge in a screw top jar for a week, and it can be used for a variety of projects. Filter red cabbage juice through a sieve. You can prepare home made “lithmus paper” to use it later. 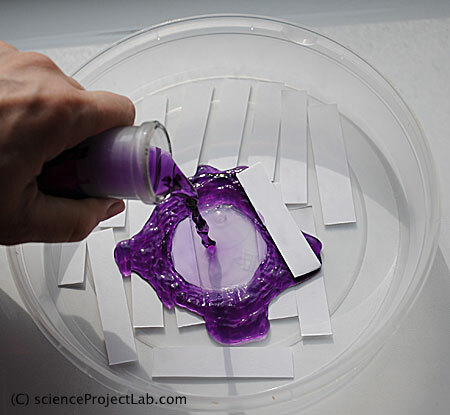 Cut blotting paper into small strips and soak it in the red cabbage indicator juice. Remove paper strips from the solution and dry them.The dried paper, if stored in a cool dry dark place, will keep its indicator qualities for several months. 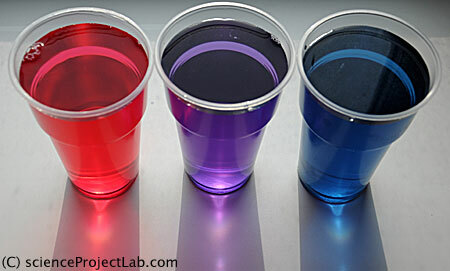 To see how the red cabbage indicator works, pour equal amounts of it into three plastic cups. Delute it with the same amount of water, so you can see the colour much better. Add a tablespoon of vinegar in the first cup. Pour some water into a second cup. Put a tablespoon of baking soda solution into a third cup. Watch how the indicator changes colour. The reaction of the red cabbage indicator with vinegar, water and baking soda. We tested the indicator with solutions of different cleaning chemicals we could find in household. You can see the results at the picture below. It looks pretty, isn't it? Checking pH of different chemicals availale in household (main ingridients of different cleaning powders and soluitons). Well, what else we could test? Here is the list of the substances you could try and their approximate pH values. Check if this homemade indicator is sensitive enough to show the difference in pH of tap water and rain water, or water from a river or lake. I think this can make a very promising sciense project. Study how pH will change if you use different concentrations of the same chemicals. Pour red cabbage juice into the cup. Dip a strow into it and exhail the air into the cup. Check if the colour of the indicator changes. The air you exhale has CO3, it connects with water and creates carbonic asid. Important note. This experiment is NOT a real science fair project experiment. It's a rather simple example of science experiement structure with a goal, hypothesis, method, data and discussion of the results. It also shows that hypothesis is not always and should not always be proved correct.